My wife & I had the opportunity to visit NYC in October 2017 for a weekend. We didn't plan much. Just to walk around, people-watch, and eat ramen at some point. It was a leisurely stroll for us and fulfilled 2/3 of our NYC plans... I'll give you a hint: We didn't eat ramen on The Highline. Bill Keys, the poem guy. 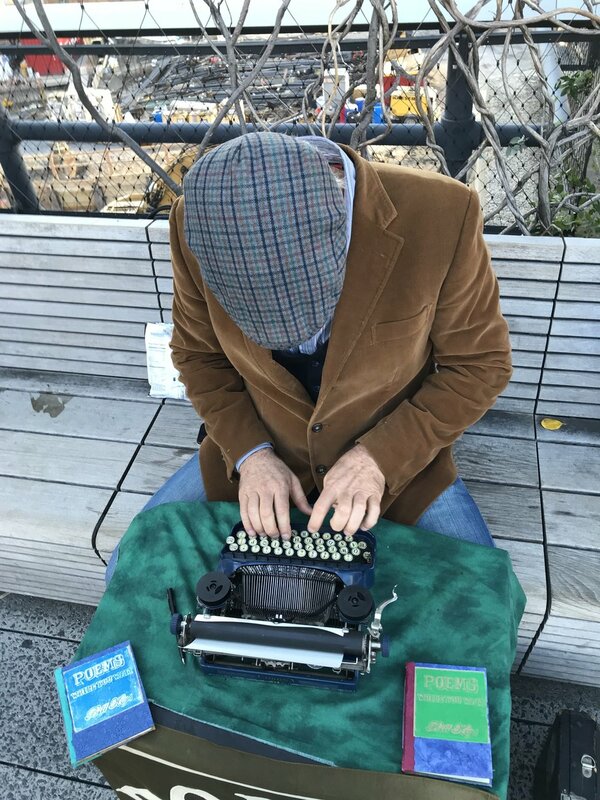 As we got to the end of The Highline, we noticed a man wearing a brown corduroy sports coat sitting at the end of a long bench with a small typewriter in front of him. A small, handmade sign in front of the typewrite simply read POEMS about anyone or anything. We were immediately intrigued, but there was a group of young women already engaging the guy. Should we wait around for our turn? Or just keep walking & people-watching? We stopped. Hesitated. Started off on our way. Then turned back around. It was just one of those moments where you realize, "What's the rush?" and you trust your gut. We waited it out as the man questioned the group of girls about their travels & work & relationships & favorite songs & whatever whatever. I honestly started to get restless. "Is it going to be worth my time to wait this out?" We only sat there 15-20 minutes or so, but when you're surrounded by the hustle & bustle of NYC, 15-20 minutes feels like a long time. Eventually we got our turn. We didn't even introduce ourselves. He just started right away. Well, right away after opening a small bag of Doritos. "What would you like a poem about?" We weren't really sure. We just wanted to see where it would end up. We were looking for a sign. Waiting for the Spirit to move. Hoping for some prophetic word from this stranger's old typewriter. We didn't want to outright tell him our story and end up weeping in front of a stranger, surrounded by even more strangers in the middle of New York City. We just wanted him to magically already know! After looking at each other for a minute, Kristina finally answered "Something about questions that have no answers." 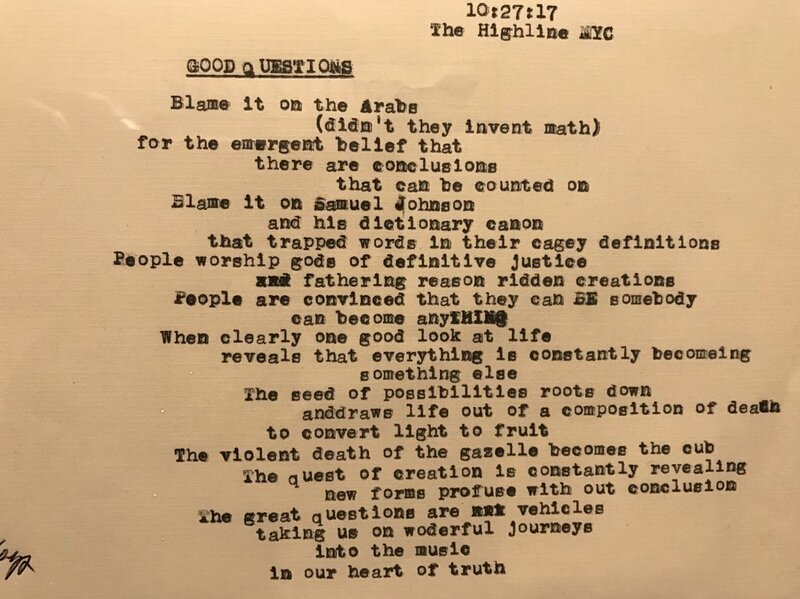 A few more questions from the poet, probing what we were really after. But we kept it as vague as we could. And slowly he got to work. He would pause to think. Type a few words. And gaze off in the distance to think some more. It was honestly kinda nerve-wracking. I just wanted to know what he had to say! Thankfully, he had a small pre-made book of poems for us to read as we waited. His own original work. Finally, he looked up from his typewriter, scrolled the small piece of paper out, and asked, "Would you like me to read it to you?" And there we stood. Weeping in front of a stranger, surrounded by strangers, in a strange city. It's not a poem I would've written for myself. And to be honest, when I heard the first line, "Blame it on the Arabs", I thought to myself Oh God, what did this guy just write? Is he just a kook in NYC still burning from the rage of 9/11? Are the strangers around us going to think we asked for some hate-filled, racist poem? What else is he about to say?!? Thankfully, my fears were dissuaded, and we now have something I will cherish forever. Without mentioning a word of our journey through grief and the unearthing of our new selves, this random poet at the end of the NYC Highline had snuck into the bedroom of our souls and left a note reminding us that we are still seen. Still heard.